Here’s a promising label that has lobbed into Graham HQ. 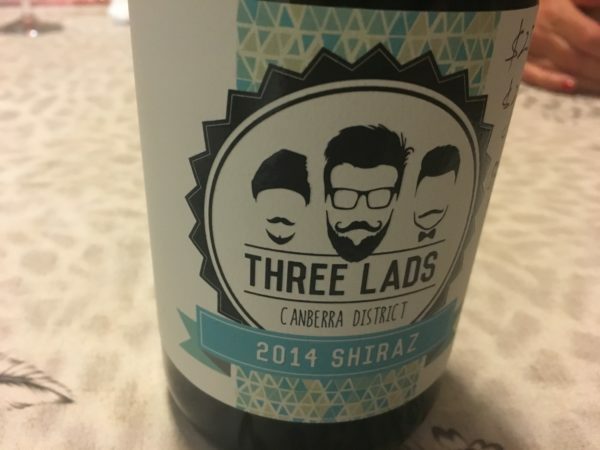 Three Lads is a a new operation involving three friends – Aaron Harper, Luke McGahey and Bill Crowe. 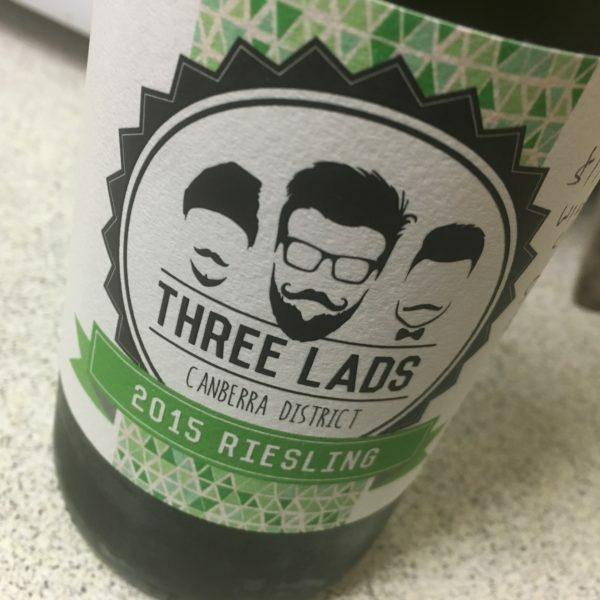 Bill is the winemaker at Three Winds, while Aaron & Luke are old friends, with this Canberra-based collaboration coming together purely by chance at the Murrumbateman Moving Feast in 2012. Like much of the range, fruit for this comes from the Canberra District and is all handpicked. Showing grapefruit, cooked limes and florals, the acidity chalky, the balance here suggests just a little residual sugar to even out the acidity – and it works a treat. Good balance and the line of limey fruit is really quite refreshing – This is really good stuff for the wine club price. Best drinking: 2016-2024. 17.7/20, 92/100. 11.3%, $22 ($17.60 from the wine club). Would I buy it? I’d go a bottle for sure. Early picked Gundagai Sangiovese, made with some deliberate residual sugar. Light pink with pink highlighter edges, this tastes of berry cream in a fun and juicy style. I find the strawberry fruit sweetness a little overt, and its shortish, but I can see the intended style. Best drinking: 2016. 15.5/20, 85/100. 11.6%, $20. Would I buy it? No. This 2013 has been held back in favour of the more juicy ’14 below. Probably a wise choice, as this masculine style is a step behind in approachability. Dark ruby, there is brawny ham and a little black pepper on the nose, the mid-weight palate dry and savoury, but lacking a little fruit, the generosity coming largely from vanilla oak sweetness. It’s nicely savoury, and long. but structure seems to be holding the fruit back for now. Best drinking: 2018-2024. 16.8/20, 89/100. 13.8%, $25. Would I buy it? I’d go the 2014 instead. Purple ruby coloured, this is such a different beast to the ’13. Juicy and full of black jube fruit, without the same meaty extraction of the ’13. Swish! Still, the palate is savoury and long, with purple berries and spicy, licoricey accents, before a finish that seems warmer than 13.8% and is nicely bitter and tannic. Really smart, mid weight modern Canberra style with fruit and tannins. Bargain at the $20 wine club price. Best drinking: 2016-2024. 17.8/20, 92/100. 13.8%, $25. Would I buy it? I’d go a bottle for sure.